There are many stripes on the South China Tiger's body and other tigers. The pattern of black and white stripes help the South China tigers to camouflage around the shadow of grass. Their stripes also can help tigers to hide on bush and tree. 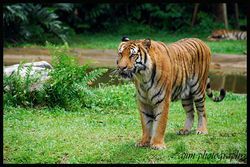 The tiger, can be up to 11 feet in length, 670 pounds as weight. They have muscular build to catch the prey even though the prey is several times bigger than tigers. The female tigers are regularly smaller than males. Both of tiger's legs and the shoulders are very powerful because tigers are using them for catching and taking down the prey. Also, legs and shoulders of tigers can help tigers to climb. Both of the legs also give tigers ability to jump well. Tiger's eyes are also very clear. At day time, they can see something as humans can see. But at night time, tiger's ability to see something is 6 times better than human's. So that they can look and catch the prey easily. Before the baby tigers born, the female tiger gestate during 3.5 months. First eight weeks, they stay at hidden things of the mother, and then after another 6~8 weeks, the mother tiger produce solid. When the tigers born, their weights are between 780 grams and 1.6 kilograms. But, some babies were died by bush fires, heavy rains. After another 18 months, they can hunt without parents. But, they are staying with their parents during their ages 2.5 years. And then, they just leave their parents and make and find their own territory which they can hunt and eat animals to live. The female tiger's sexual maturity will be prepared between three and four. 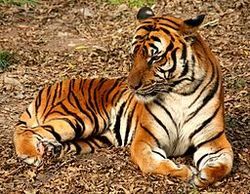 Male tiger's sexual maturity will be prepared between four and five, similar to female's age when the females reach sexual maturity.. 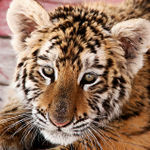 When the child tiger is born, the mother tiger protect the child tiger, or give food and water to child tiger. After several years, mother tiger teaches child tigers how to hunt the animals. After 2 or 3 years, the mother tiger leaves the child tigers, and they live themselves for whole life. South China tiger hunts prey down. ↑  "Tigers in Crisis" Web. 2015 last updated. ↑ "Amelia Gibson" [www.tigers.org.za/south-china-tiger.html] "Tigers" 14 Oct 2014, last updated. ↑ Bioexpedition. Tigers-world Web. Dec 17th, 2014 last updated. ↑  "BioExpedition". Web. Dec 17th, 2014 last updated. ↑ Bioexpedition. [www.tigers-world.com/tiger-Information] Web. Dec 17th, 2014 last updated. ↑ Amelia Gibson. Rare Tigers Tigers Oct 14th, 2014 last updated. ↑ "Dale Miquelle" [www.tigrisfoundation.nl] Tigris foundation. 1998, last updated. ↑ Ashraf Mohammed  Tiger Ecology and Conservation. Sep 4, 2014 last updated. This page was last modified on 29 October 2015, at 19:25.